With a summer job at Bob & Bob Records in Berkeley, California, teen music junkie Allie is ready for anything. She’s poised to fall in love, catch a thief, and make a mix that’ll break your heart. And when she blogs as The Vinyl Princess, Allie is the sort of mystery girl you can’t resist tuning into. Get ready for the vinyl revolution! Review - Reading this book is a little like struggling to work out who you are as a person. Your identity is seemingly in flux and there are many details and facts floating around but you're not exactly sure how they all fit together to make you. 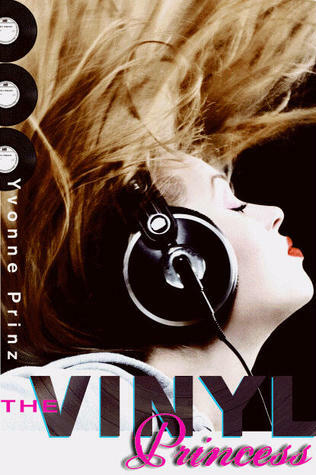 The Vinyl Princess is a book that knows what it wants to be but isn't wholly successful. If it were a tiled floor I would say the grout was missing, it has all the right pieces but just doesn't mesh together entirely. The characters voices were indistinct, the protagonist never really distinguishes herself outside of her interests and the book's agenda is pushed a tad too hard. And yet I enjoyed it to some degree. Prinz educated me with her vast knowledge of music which was cunningly added through Allie's blog entries and discussions with other music junkies. Though the occasional long tract of music tracks and musician's biographies seemed a little indulgent of the author's own superior knowledge. There's a fine line between too much and too little information and the author seemed to enjoy treading into the former. I suspect some of my discontent with this book stems from the depiction of a blog. It is a fantastic device to use as part of the narrative but some of the facts of it were a little off base. Most readers probably wouldn't be aware but I certainly did. Allie gains popularity for her blog almost immediately scoring hits and comments that climb in frequency at rates that just aren't authentic. At one point she mentions having had 42 comments early on and I nearly fell over...that's not realistic at all. There are elements were a web designer offers free service and a business offers to buy the site within two months of the blog being launched and it just didn't sit right with me. Mostly it was the superficiality that began to grate. A scene where something quite traumatic happens is quickly brushed aside as an embarrassing situation rather than a terrifying one, supporting characters float around to engender laughs but don't really propel story or growth and very little happens. Every character is outwardly quirky in an unrealistic sense. I believe Prinz had great intentions in pushing the value of vinyl and the independent record stores but the shallowness of the endeavour paled what she did achieve. In attempting too much, she achieved very little. A well intentioned examination of a music geek's summer adventures in a very unique neighbourhood. Oh, dear. I hate it when the superficiality begins to grate. I've encountered what seems like a spate of those lately. I had higher hopes for this one. Too bad. Hmmm... The cover grabbed me right away but after reading your review I think I'll gravitate toward something else... Thanks for the info! Your review is spot on! Being a music lover, I really wanted to like this book, but it just fell flat for me. And the unrealistic blogging stuff stood out to me too. yeah, this book was a little sparse in terms of the plotline but i still had fun being inside a brain like Allie's.